The Pacific Rim National Park area is a beautiful and pristine jewel decorating the west coast of Vancouver Island, near Tofino. Easily accessed from Vancouver, B.C., Seattle, WA, and other mainland North American cities, the stretch of coastline encompassing Long Beach near Tofino is nothing less than one of the most spectacularly scenic hiking areas on the planet. Here, the influence of the Pacific Ocean has been dramatic. The awesome beauty of craggy sea stacks, stark rocky headlands, wide, sandy beaches and lush rainforests are all intertwined with a vibrant cultural history extending back through the ages. In addition to an incredible variety of terrestrial and marine plant and animal life, human history has marked the area in fascinating ways. Native people, explorers, lighthouse keepers, shipwreck survivors, homesteaders, and missionaries all have traveled along the many trails and beaches near Tofino. The Pacific Rim National Park Reserve system protects the outstanding natural features of this area for present and future generations. Hiking in Tofino offers plenty of adventure for both exerienced trekkers and visitors of modest ability. 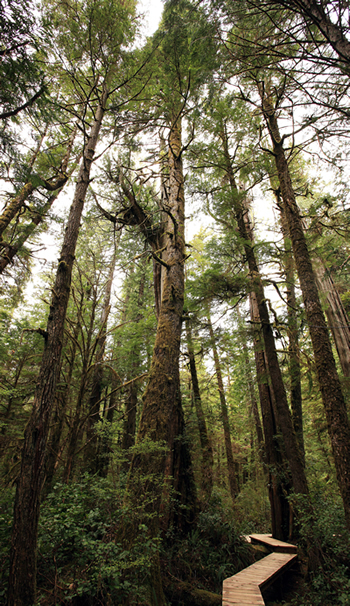 Hikers of all levels of ambition can enjoy the stunning natural environment of the Pacific Rim area near Tofino on foot. Visitors may experience the unique beauty of the Pacific Rim on short, easy walks, or take on more challenging adventures ranging all the way up to the West Coast Trail, across Barkley Sound. These are but a few special features of hiking in Tofino and the Pacific Rim.